Happy new year! It’s already January 4… how fast time passes by! In a few days, we would be surprised that its already the middle of the month and then, a month has passed by. For stay at home moms like me, its so easy for time to slip by… while doing daily chores and activities… sometimes, we can easily lose control of how we spend our time. Instead, our daily activities control us. This year, while the year is just starting, I think it is best that we set goals. I haven’t written down mine yet, but it is my goal to write down my goal, (that sounded funny!) if not for the month.. my goal for the week. I have mentioned that I want to live each day with a purpose so what better way to do it than setting a goal at least one goal a month and be able to reach that goal. I hope to set aside one night this week to do just this… but definitely, goal setting is a must for me this year. 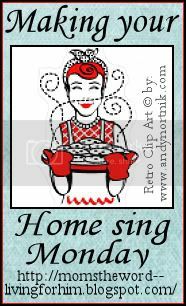 For more Making Your Home Sing, check out Momstheword! Very good idea! Somtimes the time really does just seem to slip away, and lesser priorities can overtake more important ones if we're not careful! Writing it down will not only solidify it, it gives you something to check off! Thanks for linking up today. Creativity and determination are probably the biggest things needed for your goals to be achieved. The creative guys always seem to make the best ideas. Still, without determination you will not make it. Never give up, that’s my motto. I have yet to try this one. I think I should, that is, if I have time. Happy New Year to you and your family, Chris! I was just talking to my sister about that very idea. Rather than setting up huge resolutions, I thought sticking to one goal each month would be a neat way to tackle our priorities. Glad I'm not the only one.